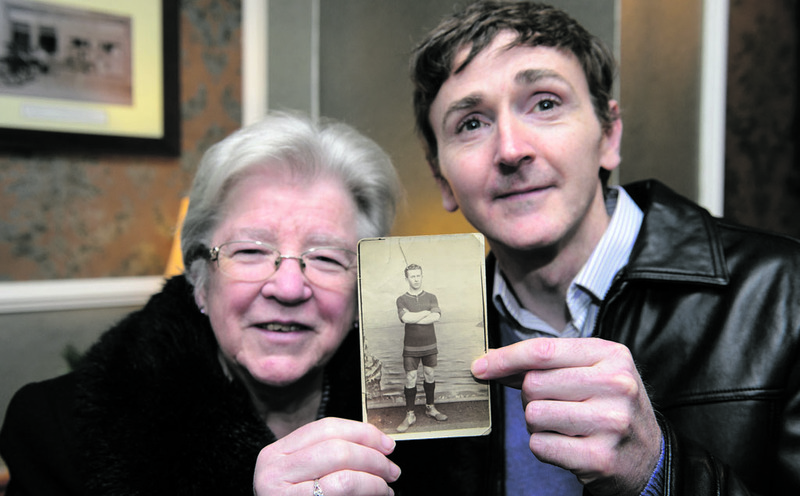 Anne Downes, a niece-in -law of Miltown player PJ Killeen and Brian Killeen, grandson of PJ Killeen holding the former Clare footballer's photog. Photograph by John Kelly. Almost 100 years to the day of Clare’s only All-Ireland senior football final appearance, the names of the players and mentors who were part of the panel, the clubs they represented, the results of each round, the venues where they played and the dates on which the games took place have all been recorded on a poster, framed and put on display at Clare GAA headquarters at Clareabbey. The framed document was handed over to Clare GAA during the senior footballers’ medal presentation ceremony at Tubridy’s in Doonbeg last Saturday night, in the presence of a number of relatives of those involved in 1917. Kilkee native JT Larkin and his brother, Michael, who played senior football with the county for a number of years, were instrumental in bringing this project to fruition. 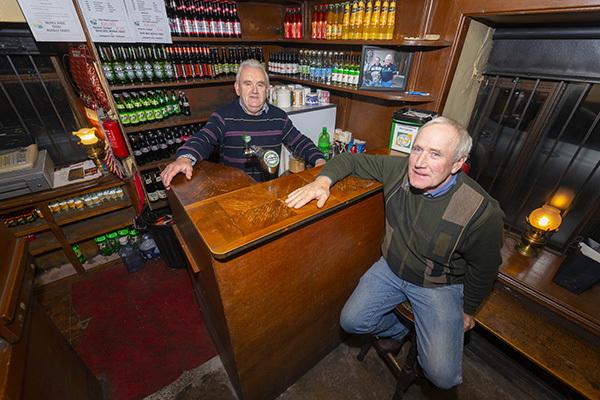 “Michael is a newsagent in Miltown and various people coming in to his shop this year raised the topic and asked if some commemoration was to take place. Michael mentioned it to me and I decided to do a bit of research,” JT told The Clare Champion this week. Apart from his keen interest in football and the fortunes of Clare, JT had other reasons for wanting to see this project brought to fruition. “I knew Jim Foran since I was a kid, as he lived near us in Kilkee. We all knew he was an All-Ireland footballer. Another member of that team, Long Jim Lucey, was my mother’s uncle and I was determined that they wouldn’t be forgotton,” he added. Colm Collins, Clare senior football manager, presenting Bernard Keane of Clare GAA with a framed poster commemorating Clare football’s All-Ireland football achievements in 1917, watched by Joe Kelly, Clare GAA Board na nÓg secretary, Thomas Francis, Ballyvaughan Fanore GAA, John Reidy, Miltown GAA, and Aidan Carroll, son of player Ned Carroll. Photograph by John Kelly. Saturday’s presentation was attended by a number of relatives of the players that made up the 1917 squad. That panel comprised: captain Jim Foran (Kilkee), Micko Connole (Kilfenora), Paddy Hennessy (Miltown), Noel McNamara (Kilrush), Taddy Pana O’Brien (Cooraclare), Michael McNamara (Kilrush), Jim Fitzgerald (Miltown); Michael McMahon (Kilrush), Joe Marrinan (Kilkee), Paddy O’Donoghue (Ballyvaughan), Jim ‘Sham’ Spellissy (Ennis); Ned Carroll (Miltown), Michael ‘Puggy’ Malone (Miltown), Ned Roche (Miltown), Tull Considine (Ennis), Paddy Haugh (Bealaha), PJ Killeen (Miltown), Jack Carmody (Kilrush), Michael O’Loughlin (Ballyvaughan), JJ ‘Tugger’ Downes (Bealaha), Larry McGrath (Bealaha), Long Joe Lucey (Kilkee), Willie Connole (Kilfenora), Bob Fitzpatrick (Miltown) and Mick Moloney (Kilrush). The members of the selection committee were Willie Liddy (Cooraclare), trainer Jim ‘Sham’ Spellissy (Ennis), Paddy Haugh (Bealaha), Michael Barry (Kilrush), Jim Foran (Kilkee), Jimmy Fitzpatrick (Kilmihil), Paddy Hennessy (Miltown), Fr M Madden (county board chairman) and Simon Eustace (Killimer). In the 1917 Munster quarter-final, Clare beat Waterford at Waterford sports field on July 15 (2-6 to 0-4). They beat Tipperary at the Markets Field in Limerick on August 26 in the semi-final (0-5 to 0-4) and they beat Cork in the Munster final at Tipperary Town on October 14 (5-4 to 0-4). In the All-Ireland semi-final at Athlone sportsground, they defeated Galway (2-1 to 0-4) on November 18, before losing out to Wexford (0-5 to 0-9) in the All-Ireland final at Croke Park on December 9. Clare lost to Wexford in the 1917 All-Ireland Football Final.